Photo was taken after the crew of SERVPRO of Babylon/Deer Park cleaned the Air Ducts of a home. We are always there to finish a job when we are needed. This was in the process of being finished with the air ducts. We are proud to offer Air Duct cleanings to our community also we clean carpets and more. If you ever need cleaning please give us a call at 631-661-3802. Please also call us if for Water and Fire restoration. We are always here to help. We are here 24/7 when you need us. This photo was taken during the cleanup process from water damage in a Town Hall. With the help of the crew from SERVPRO of Babylon/Deer Park. The water damage was resolved and cleaned. Please give us a call for any issues regarding water/fire at 631-661-3802. 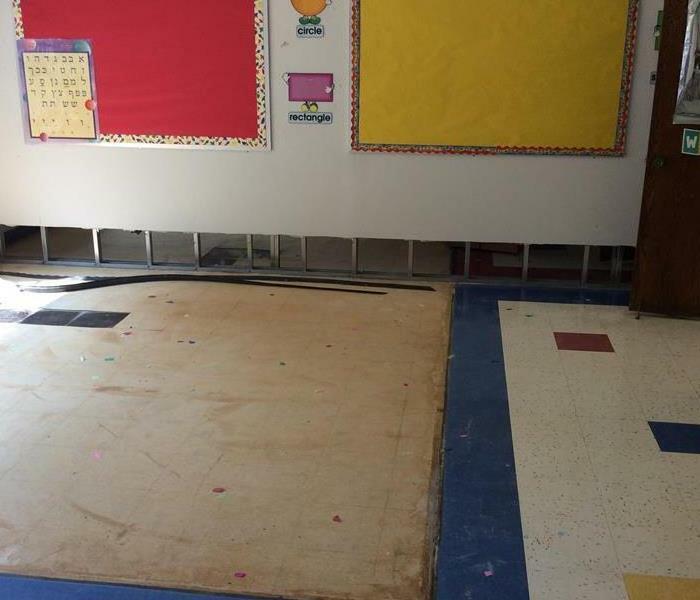 This photo was taken after water damage in an elementary school. 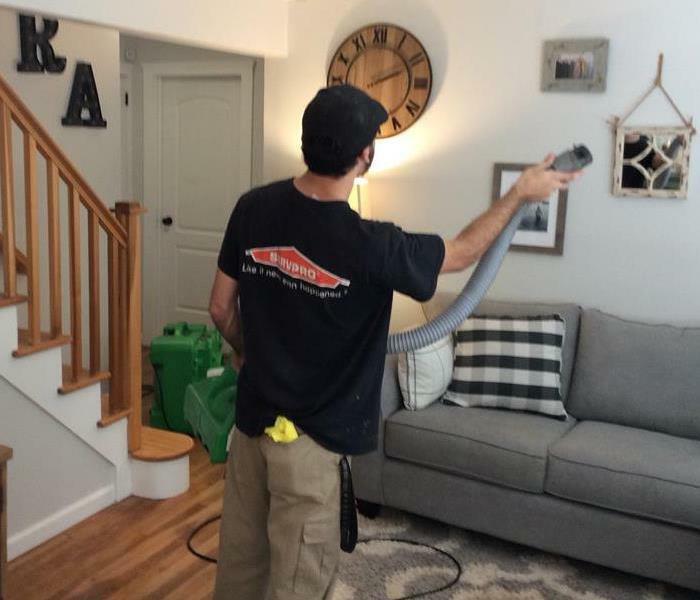 SERVPRO always makes sure that everything is always cleaned up and made sure everything is perfect for the customers. SERVPRO of Babylon/Deer Park is always here no matter what! This was taken in the process of cleaning up damage in an office building. The crew always at SERVPRO of Babylon/ Deer Park never fail to resolve and satisfy a clients issue. The office building was completely dried and salvaged, thanks to the SERVPRO. 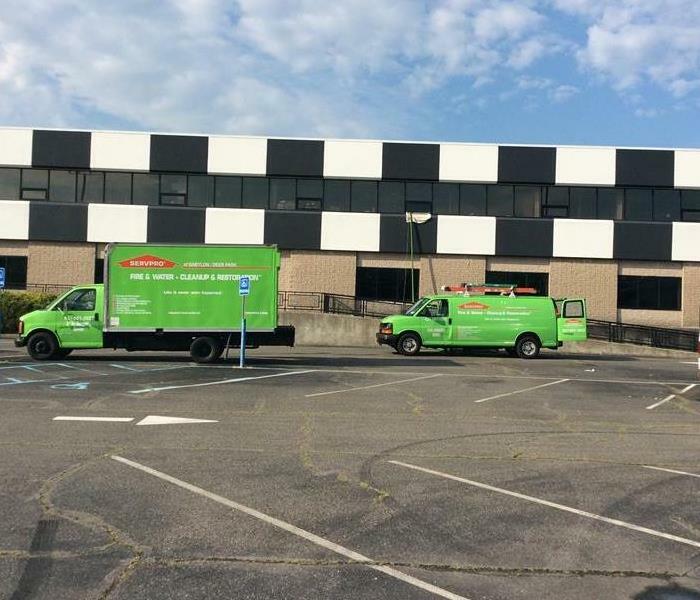 The crew of SERVPRO of Babylon/Deer Park came to a commercial building. When they arrived at the building. They were prompt and eager to help work and fix the water damage that was in the building. SERVPRO is always here to help. "Like it never even happened." This was a home in Deer Park New York, Aa pipe disconnected at the joint and was pouring water in the bedroom, homeowner was home to minimize the damages, call us and we removed water, installed equipment that day. Came back to reinstall the carpet and padding and clean and disinfect the carpets. This was in Lindenhurst New York, A home by the shore was devastated with high rain totals along with high tides, the water kept coming back in for four days, we eventually were able to remove the water and dry out the basement with drying equipment. This was a home in West Babylon New York. The rains continued for two days with rain and heavy winds, when the ground could not absorb any more water, it found its way into this basement with over one foot of water. At the recent Nor'easter in Dix Hills New York, this customer had at one point over two feet of water coming in, as he was trying to take it out it just kept coming back, he decided to call in the pros at SERVPRO of Babylon/Deer Park to handle the situation. Some times you just have to call in THE PROS. This was a home in Copiague New York, Three months after solar panels were installed on their roof mold started forming due to a small leak. We were called in by the Solar company to perform mold remediation, homeowner and solar company are once again on speaking terms. This fire happened last week in Lindenhurst New York, it was from a candle that was left on while the occupants went out for dinner for dinner. Please remember to put out any candles while sleeping or leaving your home. We had to gut the entire home due to heavy charring and smoke damage. This was a fire in Lindenhust New York. When we arrived on the scene the fire department was just leaving. It was a cold evening and the homeowners were pretty shaken up. I sent one of our employees to Dunkin Donuts to get some coffee and donuts and try to add a little comfort to these people. We always keep water and blankets on our trucks because in our business you never know what to expect. It turned out to be an electrical fire from a charger in the daughters bedroom, the family was downstairs as the fire was going on and smelled smoke. The smoke alarms never went off due to the batteries being dead. We boarded up the home and returned the next morning to see if they would like for us to due the smoke removal, demo and whatever else they would need. Due to an act of kindness the homeowner wanted no one else on their loss but SERVPRO of Babylon/Deer Park. Remember to change your batteries often in your smoke and carbon dioxide alarms. This was a pipe break at a tax firms building in West Babylon, New York in January. This occurred over the weekend so as far as how long the water was running, no one knows, but we figure with a four day weekend it was running at least three days due to the amount of water, good thing it was the first floor so some of the water was flowing out the back doors. This gives a new meaning to floating floor, the water was under the flooring causing it to float, all of the flooring throughout the entire office space had to be removed, the floors dried out with equipment. After the drying process we installed all of the new flooring and the contents throughout the entire floor were put back. We had the insured up and running within the week, with the tax season under way the insured was very happy. This was a 3 story office building in Islandia, New York. We received the phone call at two thirty am New Years Day if we could respond immediately to a three story pipe break, by 3:30 I was on site with the building manager accessing the damages and putting together a game plan that would be safe for the building tennants on how and where we were going to begin, by four thirty am the crews arrived and started the removal of debris and the pumping out of water, by the end of the day we were installing all necessary drying equipment. The building manager was so happy that we have become his go to company when a disaster strikes or when any cleaning services are needed. Another happy customer. 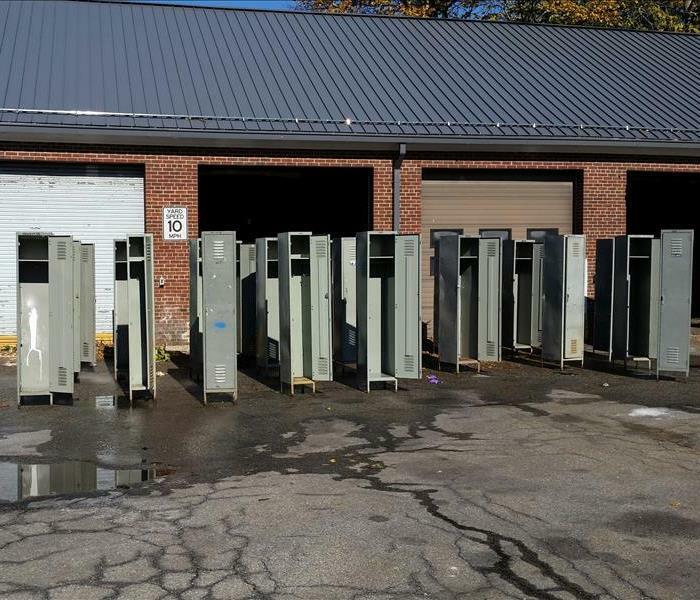 This water facility plant is located in Suffolk county, New York, since this facility is not entered often until it has to be inspected the problem with the mold continued to go unaddressed for over a year. We were contacted to give a bid, , six more months went by before the bids were opened and accepted. This was an unusual and challenging mold remediation job, We had to set up scaffolding on second level grating to reach different areas that otherwise could not be reached, we had to set up containment all around the water tanks so they would not become contaminated. we had to create our own access to install the negative air machines until the project was completed. This is a home in Babylon, New York right on the water. We had a winter storm at the same time the tides were at their highest causing a devastating ordeal for this homeowner. They left in the morning for an affair Upstate New York and no one was looking after the home. The water rose came through the flooring destroying the flooring, cabinets, appliance and all contents on the main level. We were called in when they arrived home, by that time there was not a thing to be salvaged turning this loss into a demolition job. We worked hand in hand with their contractor to make sure they could get back into their home as soon as possible. It is amazing how much damage water can cause. This is a home in Wyandanch New York. This is a one story home with an unfinished basement. The homeowners were away on vacation and we had a heavy snowfall. The heavy snow which was followed up by some rains were to much for this roof to support, the roof collapsed and all the snow that was on the roof along with water that came from broken pipes due to the roof collapse wound up in the basement, we were called in by a relative, had the tarp installed on whatever remained of the roof , supplied temporary power so we could run our drying equipment, pumped out all the water so the contractors could come in and do their repairs. This was a house in Copiague New York in January 2017, This home is close to the water and was under a major construction project. All of the insulation was not yet installed in some areas and all the heating system zones were not yet functional. On this Friday evening there was an ice storm with heavy winds and being close to the water made it even worse, the pipes in the ceiling had burst causing damage to the new hardwood flooring and some of the walls. We supplied temporary heat, installed drying equipment and contained the problem resulting in a minimal loss for the contractor. this home is in North Babylon New York, In May of 2017 this whole basement was just remolded from top to bottom. after five months everything came out beautiful, just like the homeowners imagined it. They brought back all the contents including expensive collectibles down the basement set everything up and went up to bed. 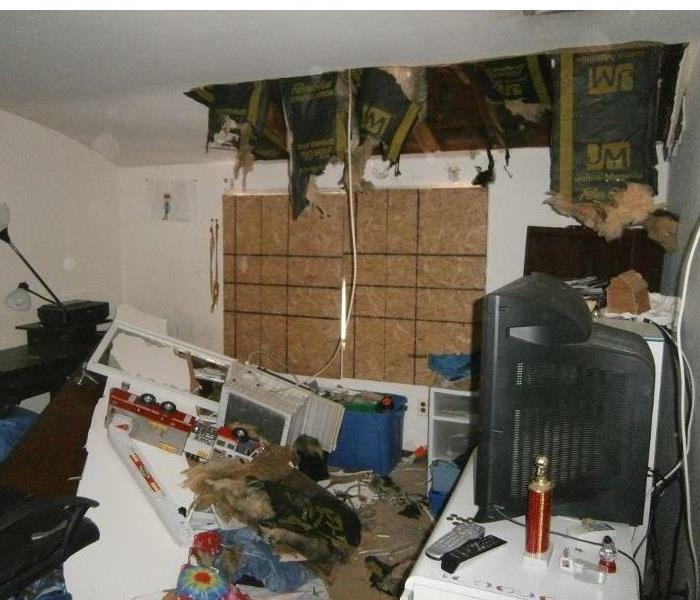 The next morning they woke to this, one pipe was never connected causing sever damage throughout the basement area and destroying most of their contents. The customer gave us the keys , went on a two week trip and asked us to handle it. When they arrived after two weeks we had the entire basement back in shape minus some odds and ends. This was a severe water damage in Deer Park, New York in October 2017, this occurred in the middle of the night while everyone was sleeping. The homeowner woke to a ceiling collapsing in the den, a toilet bowl malfunctioned in the above apartment causing water to run onto the ceilings. when we arrived, the den ceiling was on the floor, living room ceiling was just about to collapse and the ceiling in the baby's room was leaking water. Plumber arrived and shut off water and we stood the night removing ceilings and water so it was safe for the family. We set up containment in the only room that was dry so the family could stay. This water damage loss was in West Babylon in October 2017, it was a for foot crawl space with over two feet of water. A pipe broke while the homeowners were on vacation, there was so much water that a neighbor noticed something was wrong due to water coming out in front of the house and called us in. When we arrived the water was still running, we called the homeowner to get permission to have a plumber come in and do the needed repairs on the pipe so we could begin our emergency services. We installed pumps to remove most of the water, extracted the rest with our truck mount extractor, removed all wet boxes with contents, supplied new boxes for the contents, installed equipment to dry the crawl space and disinfected. By time the homeowner came home from vacation, they were ready to start the repairs. West Babylon New York, October 2017, we were called in to check if this home had mold. Upon a visual inspection none was detected, we used a Flir camera and detected damp areas in the bathroom around the shower area. We proceeded to drill a small hole and inserted our flexible eye camera and there it was. We now determined where it was, we removed the sheetrock and insulation with mold and treated the studs . Sometimes you can not determine if there is mold by a visual only. Today we have many different specialized tools for mold remediation. This was a bad mold infestation in Amityville Harbor New York In September 2017. Between a slow leak that went unnoticed for a couple of months together with insulation and a vapor barrier, this was compared to a perfect storm in which the moisture was trapped between the insulation and a vapor barrier causing mold to form at an alarming rate. This was a full face , complete with full gear from head to toe. All insulation and vapor barriers were removed mold remediated and reconstructed with the correct amount of insulation. All is well and everyone is happy. This kitchen fire happened in August of 2017 in Copiague, New York. This was a grease fire that extended through most of the home, we were called in that evening at dawn for a board up and returned the next morning to start with the demolition, when demo was complete we proceeded with the smoke removal and deodorization. Our services also include supplied dumpsters. providing a storage pod for a pack out of the salvageable contents and removal and cleaning of salvageable clothing and drapery. We also supplied a generator for temporary lighting for the affected areas until the electricians could show up. This was an electrical fire in the upstairs bedroom in April 2017 in Wyandanch New York, the good news no one was injured, the bad news that the house was uninhabitable due to all the burnt areas and smoke damage This was a total demo job, all debris were put in supplied dumpsters, any salvageable contents were put in our supplied storage pods, all cleaning of framing was done from top to bottom, home was deodorized and prepped for repairs , reconstruction was done, homeowner was back at home in a short amount of time and was thrilled at the professional services that we had provided. In may 2017 in Babylon N.Y. we were called in to clean a factory fire. SERVPRO men and women set up flooring made of plywood to get to unreachable areas up top on top of caged fencing. When it comes to a thorough cleaning, sometimes you have to think outside the box. Another happy customer with minimum amount of downtime. SERVPRO of Babylon / Deer Park responds to a factory fire in Deer Park in the middle of a snow storm. This was the polar vortex of 2014, we had to use snow blowers to clear walkways and driveways to access this home. Living room before emergency services due to a pipe leak, This was a home in West Babylon, New York. Back in April 2016 we were called in due to a foundation leak that was ignored over time. We remediated the mold that had affected all flooring, walls, insulation and contents, we supplied the dumpsters so we could remove all of these items, set up protective barriers so we could transport all items through the rest of the living area. Customer was so happy with our remediation, we were asked to do the reconstruction. It is very important to address these issues as soon as they are discovered. Customer in Ridge ,New York. in September 2017 Family was feeling ill, we found the reason. Tenants in the apartment never told the homeowner there was any kind of problem for 3 months. This was a severe mold remediation job, all areas hadto be addressed due to the amounts and history of the problem. Not only did we have to due the mold remediation in the visible areas we also had to address the rest of the living space due to health concerns of residents upstairs. Fully remediated the loss and happy to say the customers are feeling much better and have a better understanding regarding the concerns and issues with mold. Living room after initial remediation. With the right solution and experience almost every carpet can respond to cleaning. This was a fire in Dix Hills N.Y.
We were not called in immediately.This was a desk after sittiing in a wet area for approximately 52 hours. This was a severe basement fire caused by a candle, heavy smoke filled and affected 1st and 2nd levels, all contents were removed and cleaned at our storage facility until all repairs were completed. This is a room on the first level, as you can see the smoke damage travels throughout the home. This is the Town of Babylon's Drug & alcohol center, It was fire bombed, we removed all glass debris, water from the Fire department and removed the carpeting. We removed and carted away all non salvageable contents, Cleaned and prepped all affected areas and used a deodorizer to help neutralize the odor. We were called in due to odor and health concerns. This is what we discovered while we were at a facility. We proceeded to clean and disinfect 3 complete systems, glad to report everyone is breathing better and no odors. Polar Vortex February 2014. Water came through the windows and onto the front of the home. Men hard at work at a factory fire. Water damage to a Babylon Village Home, We responded that morning to remove hard wood flooring, subflooring drywall and insulation. This home's crawlspace was filled with water and contaminated debris, removed all and treated.